The X-Core is a four-lug ball-and-socket that features a 3/8 inch drive, laser-etched markings for size identification and a 30-degree flex angle with 360-degree rotation. The product in available in sizes ranging from 8mm to 15mm and in two three-piece sets. SPARKS, Md., Oct. 29, 2018 /PRNewswire/ -- After releasing its X-CORE™ Pinless Impact Tool Line less than a year ago, GEARWRENCH®—a premier brand of hand tools and accessories from Apex Tool Group—saw an opportunity to improve on the success. This year, GEARWRENCH developed the new X-CORE Pinless Universal-Joint Impact Extensions and Socket Extensions, giving the X-CORE line even more leverage on the competition. Compared to even the best pinned impacts, X-CORE Pinless impact tools deliver far greater durability and access. 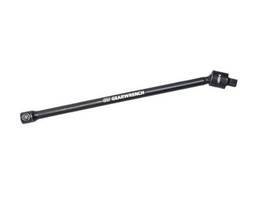 The exclusive four-lug ball-and-socket design of these GEARWRENCH universal-joints, sockets and extensions provides the long-lasting strength and capability needed to take on the toughest automotive and industrial applications. "We addressed utility with the release of the X-CORE Pinless Impact Tool Line in 2017, and this year we took it a step further with greater access than ever before," said Product Manager Jarrett Wolf. "Now, mechanics and techs can get the benefits of our pinless sockets and joints in more places with the same successful results." The 3/8-inch drive GEARWRENCH X-CORE Universal Socket Extensions are available individually in seven sizes ranging from 8mm to 15mm or as a seven-piece set. Off-Corner Loading technology virtually eliminates the rounding of fasteners. The Universal-Joint Extensions are available individually and in two three-piece sets (3/8-inch or 1/2-inch drive) at 6-, 9- and 12-inch lengths. Both the Universal Socket Extensions and Universal Joint Extensions feature high-visibility laser-etched markings for quick size identification, a 30-degree flex angle with 360-degree rotation and a black oxide finish for corrosion resistance. For more information, go to www.gearwrench.com. GEARWRENCH is a professional hand tool brand from Apex Tool Group, one of the largest hand tool manufacturers in the world. The product line includes wrenches, ratchets, sockets, pliers, impact products, tool storage, torque wrenches and more. The brand serves professional tool users, primarily in automotive and industrial markets, including MRO, construction, mining, energy, transportation and utilities. Visit www.gearwrench.com. Apex Tool Group, LLC, headquartered in Sparks, Maryland, is one of the largest worldwide producers of industrial hand and power tools, tool storage, drill chucks, chain and electronic soldering products. Apex serves a multitude of global markets, including automotive, aerospace, electronics, energy, hardware, industrial, and consumer retail. Visit www.apextoolgroup.com. QFN Socket is designed for 0.5 mm pitch QFN 64 pin ICs.